Ástor Piazzolla (1921-1992) was born in Argentina. He lived in New York from age four to sixteen, when his family returned to Argentina, but not before he acquired a love for the music of Bach and Duke Ellington. Studying with Ginastera in Argentina, he analyzed music of Stravinsky, Bartók and Prokofiev. At the same time he made arrangements of Tango music. In 1954, age 33, he went to Paris on a scholarship and studied neoclassical counterpoint with the great teacher Nadia Boulanger, who, hearing him play a tango he wrote, told him, "Astor, this is beautiful. Here is the true Piazzolla – do not ever leave him." This was characteristic of Boulanger, who insisted that all her composition students be true to themselves. She had declined to take on Gershwin, lest he spoil his own gift. Piazzolla's music was to reflect a taste for several kinds of music, as is illustrated in the present selection. Nuevo tango is Piazzolla's multicultural combining of classical, jazz, klezmer and rock styles. Cotik mentions that Piazzolla was profoundly affected by hearing Gerry Mulligan's Octet. Until now, Piazzolla was known to me only from a piano recording of his nine-minute tribute to his late father, Adios Nonino, arranged by Laecio de Freitas, and played by Oscar Macchioni on a recording Mostly Tangos, on Eroica JDT3442. Tomas Cotik, who produced this collection, arranged six of the pieces here – none was originally composed for a violin/piano duo – and performed the violin part on each. Like Piazzolla, he was born in Argentina, which he left when he was 16. His musical interests were classical up till he was at the University of Freiburg and decided to write a thesis on Piazzolla. Later, in Toronto he tried to learn tango from a Pakistani teacher – unsuccessfully, he says. Then he taught in Texas and Miami and played in the New World Symphony and a string quartet. 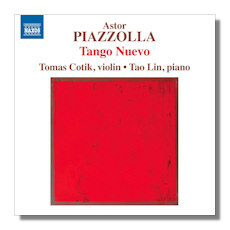 Piazzolla's music appeals to Cotik as a classical musician. In his superb notes he describes the composer's characteristic rhythms, harmonies and melodies. Regarding what the music expresses, he says that in it he hears "aggression and madness, the honking, the chaos, the drunkenness, dizziness and the energy of…Buenos Aires." In Piazzolla's slow melodies, he feels "smoky atmospheres and veiled feelings, vegetative states of mind, wistfulness, nostalgic love…melodies sung inside a person's head and at other times sung out loud." He also says that "filth" and "trouble" (camorra) are characteristic elements in tango. I have never been to Buenos Aires myself but my wife has and saw a fair amount of tango there – hard not to, from what I understand; she told me that hearing Le Grand Tango brought her back there vividly. While there, she was particularly impressed with an elderly but highly skilled couple who earned vigorous applause from those who saw them. She said that the slow first part of this, with its swinging rhythm, would have been well within their capability but the loud, emphatic and enormously vigorous part that follows this would require a much more youthful and vigorous couple. In spite of the title, La muerte del angel is crisp and lively. The "history of the tango" piece (18 and a half minutes) is in four movements, representing the dates, 1900, 1030, 1960 and the present time. The opening movement, called Bordel, is cheerful and upbeat, with a skipping pace beginning with the sounds of stamping feet (not sure if real or simulated) and a rippling piano. The brothels, Cotik notes, were occupied by French, Spanish and Italian women, and catered to "policemen, thieves, sailors and hoodlums,". The tango in the 1930 Café was meant for listening rather than dancing and this music is slow, quiet, melodic and flowing; lively only briefly. The 1960 Night Club was varied in pace: lively at first then slower, expressing yearning perhaps, before becoming very fast at the end. Cotik reports that Brazilian bossa nova and the new tango moved to the same beat and older tango forms changed. The final movement, today's tango, Concert d'aujour'hui, has seen music of Bartók and Stravinsky take on some "reminiscences" of tango, as Kotik puts it. The Melody in A minor (Canto de Octubre) is beautiful and flowing, sad and pensive with only momentary intensity. It seems mis-described in the unsigned note on the back of the jewel case as expressing "deep personal turmoil." To my ears, this has to be from a confusion with the Tango in A minor (Tanguano) which follows, and to which the description would more aptly be applied. However, Cotik suggests that Piazzolla may have meant the piece as an elegy for his failing marriage of 25 years. Milonga sin palabras, a kind of song without words which comes from a style originating in the Rio de la Plata area of Argentina and Uruguay. (Piazzolla was born in Mar del Plata.) Fuga y misterio, from María de Buenos Aires begins with sounds of stamping feet and yields to broad melody. The other number from that same work, Yo soy María (I am Maria) is fast, dance-like and soaring and assertive by turn. The piano plays notably faster than the violin – and not just in this piece, somehing which adds interest to Piazzolla's style. Ave María, composed for the film Enrico IV, (Pirandello's Henry IV) and sandwiched between those two pieces on this recording, features lovely, flowing melody. Oblivion, another milonga, with a second violin, is slow and a piece which particularly reminded my wife of the expert and dignified dancing of the elderly couple in Buenos Aires. It was composed for the same film as Ave María. Aire de la zamba niña is a lovely and plaintive piece. The title translates as Air of the biracial girl – or of the "half-breed" girl, according to a 1968 dictionary – surely a slur. A zamba was a mixed-race person – Indian and Black. Le Grand Tango, already mentioned, was written for the cellist Rostropovich in 1982 and premiered in New Orleans eight years later. The transcription was made by a Russian composer somewhat associated with the older Shostakovich. The brief final selection here, Libertango, is again notable for the violin playing slowly against a fast piano. This recording, and Cotik's long commentary on it, can be particularly recommended, not only for the considerable listening pleasure it offers, but also for the varied and satisfying feast of the different stylistic forms it displays.